A couple of weeks ago, I received the book If the Buddha Came to Dinner by Halé Sofia Schatz via a swap on swap.com. Seems like I’m on a food & nutrition reading marathon right now… I read Little Sugar Addicts right before this one and now I’m working through the The World Peace Diet . I think I’m on a quest to find perfect harmony with the food I eat. 1) Who Are You Feeding? – What emotional history is dictating your relationship with food? 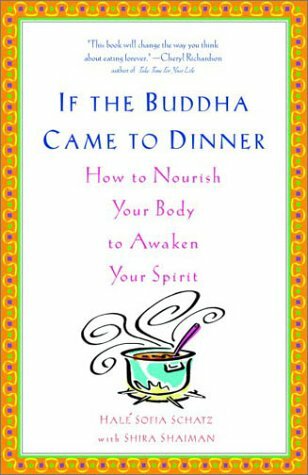 2) Nourishment as Daily Practice – Practical info about food & the cleanse. 3) Awakening Your Spirit – Practice mindful cooking & eating. It’s important to admit that you have a problem with food (assuming you have a problem) and recognize that what you eat is not nourishing. Whole foods (veggies, fruits, nuts, seeds, beans) and lean meats/dairy products provide the best nourishment – big surprise! Sugar, processed foods, refined flour products, caffeine, alcohol, and red meat are bad – doh! The digestive system works best when combining food the right way: fruits alone, veggies with either grains (not wheat!) or lean protein. Grains and proteins should not be eaten together. Cleansing your system every now and then is a good idea (more on this below). Cooking (being a “kitchen alchemist”) is an important part of nourishing yourself. The book did inspire me to do a “cleanse.” The cleanse described in the book is 21 days divided into three phases (fruits & vegetables, grains, protein). It also requires a preparation phase of a couple of weeks to reduce the intake of the “bad foods” listed above. Also, the author does not recommend doing the cleanse during winter, due to drop in body temperature. I’m pretty much skipping the preparation phase, because I don’t eat a lot of “bad foods” as it is (the sugar-laden sweet potato casserole sitting in the fridge is probably the biggest exception to this right now…). I am going to do a mini-cleanse instead of the 21 days (I’ll save that for the summer). I’ll do one phase each day. This is actually recommended if it is the first time. I have stocked the fridge with veggies, fruits, and nuts and the pantry with canned fish and beans. According to the author’s recommendation, I also purchased dandelion root tincture and a probiotic (acidophilus) – not cheap! My goal is to create a retreat experience at the same time. I hope to spend lots of time reading, singing, playing the piano, burning candles, praying, and just being. Of course, my daily responsibilities don’t stop, but I’m going to try to minimize stress and external stimuli (i.e., the social media sabbatical continues). I’ll write a quick post each day to let you know how I’m doing. Have you ever done a cleanse? If so, what was your experience? Update: Read about Days 1 & 2 and Day 3.